OK I am pretty excited to announce that I have a channel on Justin.TV. In case you haven't seen this site yet, it's like Youtube but for live broadcasting. Using their web-based 'broadcaster' I can DJ live from my garage and people can tune in and chat. I'll be on there in the evenings whenever I can, around 10pm US-Pacific time, spinning classic jungle and dubstep records and who knows what else. This is pretty wild for me because I used to do a lot of 'webcasting' back in the day. 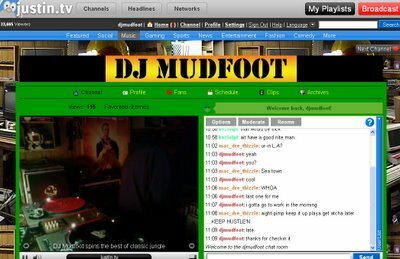 Some friends and I founded the Betalounge back in 1996 and we used to spin live online every Sunday. I've done live DJ sets over the internet from clubs in San Francisco and New York, and I spun on the original internet pirate radio station in London. It used to take a lot of equipment and jury-rigging to pull this off... So it blows my mind that anyone with a laptop and an internet connection can do it now. The Justin.tv site is not perfect, mind you... they have a lot of work to do. But it's still pretty amazing, and I'll be in there trying to make the most of it. So drop over there and check out my channel, add me as a friend, and hit me up in the chat when I'm broadcasting. Last night I talked to folks from Chicago and Seattle while I was spinning, it was great!